The other week I nipped in to Wilkinsons in Bury to pick up some small plastic pots. As I wandered around the gardening section, I spotted a shelf crammed full of miniature cacti, scattered around, pots all over. Although they’re not edible and don’t attract pollinators, I do like the shape, form and texture of a nice cactus. 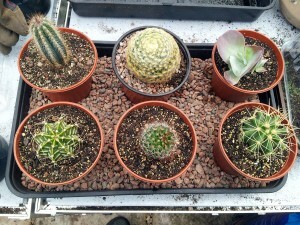 Priced at just £1 each, not likely to take up much space in the greenhouse and in desperate need of rescuing from Wilko’s, I decided to treat myself to a fiver’s worth – four cacti, one succulent – and brought them home for re-potting. The first step was to make up a suitable potting mix. I used equal measures of sandy seed compost, horticultural grit and vermiculite, the better to simulate the rough, sandy desert soil. 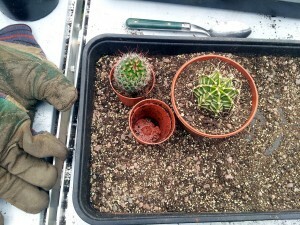 Then it was a case of on with the thick gloves, ease each mini cactus out of its pot (they were bone dry and root bound, as you’d expect), then site it in a larger pot – about 2-3cm of extra diameter, no more at this stage – and back-fill with the potting mix, using a spoon to slide it in and tamp it down to avoid a spiny surprise. 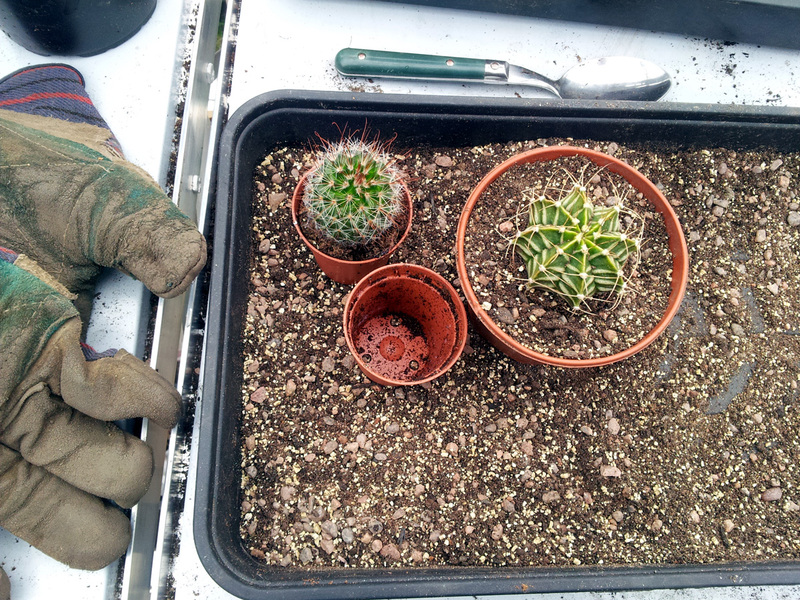 Thick gloves and a spoon are essential kit when re-potting cacti. 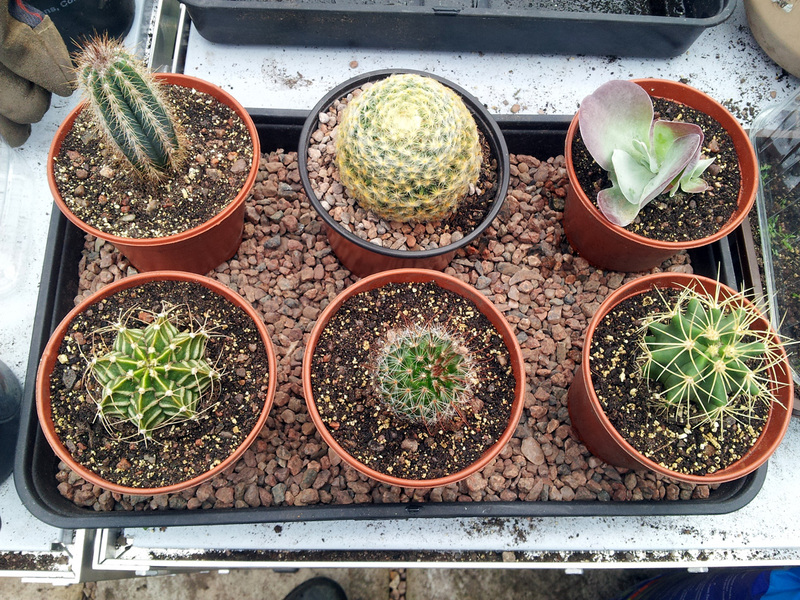 After I’d re-potted them all I gave them a good bottom-soaking before positioning them in a gravel tray full of gravel and finished off the pots with a top-dressing of gravel as well (after I took the next pic). They’re now up on a south-facing shelf, the better to soak up as much Spring sunshine as we can muster. I have no idea what species and/or cultivar any of them are, of course, so if anyone can i.d. anything in the pic below, I’d be very grateful for a comment. All done (with an extra that I already had) and looking very nice indeed. I look forward to seeing them grow on over the summer and will probably re-pot them again into the next size up this time next year.